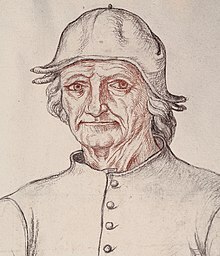 Líníocht d'fhear ag caitheamh hata, i leith Jacques Le Boucq , Portráid de Hieronymus Bosch. c . 1550. Gluaiseacht Luath-Phéintéir Ísiltíreach, an Renaissance. Tugadh an leathanach seo cothrom le dáta an 21 Samhain 2015 ag 19:14.